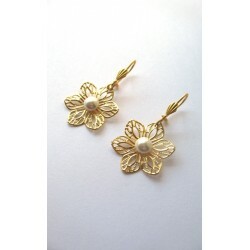 Lotus flower earrings, gold filigree earrings with swarovski pearls, vintage style. Lotus flower earrings: 1.2"/ 3 cm approx. Dainty lotus flower earrings suitable for bridals, bridesmaids and also as a everyday accessory.